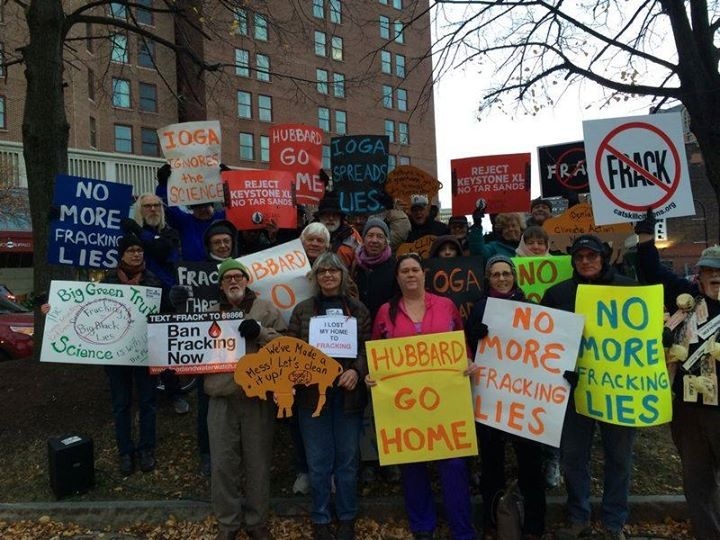 The Independent Oil & Gas Association of NY (IOGA) is the chief oil and gas lobbying organization in New York, spending millions to back fracking and natural gas development in the state and oppose environmental safe-guards. IOGA will be holding their 2014 Annual Meeting in Buffalo from November 11th to 12th. This year the keynote speaker is Jack Hubbard who will lecture on “Big Green Radicals: Winning Public Opinion, Undermining the Activist’s Credibility and Changing the Debate.” Jack Hubbard works for a Washington D.C. law firm Berman & Co, who specializes in undermining the work of environmentalists. Their PR effort is entitled “Big Green Radicals.” We will give them a good Buffalo greeting. View the event on Facebook here. Last Friday the NY Times published a secretly recorded talk given by Hubbard’s colleague, Richard Berman. Besides being anti-environment, Berman is strongly anti-union. They have also directly targeted Food & Water Watch by name. Cosponsors: WNY Peace Center, Sierra Club Niagara Group, Western NY Drilling Defense, Food & Water Watch, and the New Yorkers Against Fracking coalition. 30 people showed up for the very chilly Wednesday 4 PM demo in front of the Hyatt hotel in downtown Buffalo. The media failed to show up having more pressing news stories to cover than the story of independent oil and gas companies assaulting the environment, endangering human lives and the story of their support of Washington lawyers who call well-respected environmental organizations “radical”. We stayed for an hour, several gave speeches on the evils of fracking including Rita Yelda from Food and Water Watch, Lynda Schneekloth and Bob Ciesielski from the Sierra Club-Niagara Group, John Washington representing the Local Economic Empowerment Task Force and Charley Bowman from the Renewable Energy Task Force. Both task forces are part of the WNY Peace Center located in Buffalo NY. The most poignant speaker was a newly minted Buffalo citizen from West Virginia. She wore a sign saying “I was fracked out of my house” — and spoke about how that “eviction” occurred. She lived there for 8 years and when the frackers showed up her well — and wells of many neighbors — went bad almost simultaneously. She decided to get out and sold her house for pennies on the dollar. We do not know if the folks at New York Independent Oil and Gas Association (NYIOGA) knew of the demo, but one person wearing a suit and claiming knowledge of hydrofracking issues — walked by and photographed some of the more photogenic demonstrators. Thanks to PAUSE for kick-starting the Buffalo demo.